Imagine life in a rural French countryside, in a place that is greatly remote, has a scarce population, in fact barely a few souls in the neighbourhood. And what it might be like if you are not a native of that place. That is what Rosy Thornton has given a picture of in her book, The Tapestry of Love. 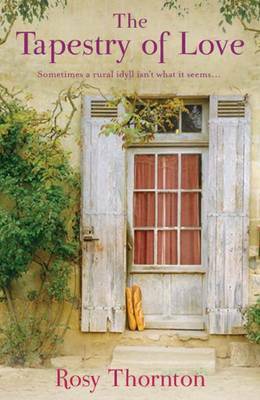 It is about Catherine Parkstone, who is seeking an idyllic life in a small hamlet in the Cevennes mountain in the French country side. Catherine is divorced for the past few years and has has come in terms with it. She has two grown up kids, Tom and Lexie, whom she loves and adores. At the age of 49, Catherine wants to make a fresh beginning in her life. She sells her house in England and moves to a small house in Cevennes. She has great skills in tapestry work and wants to set up a small business as a seamstress to earn a living. Slowly Catherine, adjusts to the place, gets acquainted with the neighbours, gets accustomed with the weather and sinks into the lifestyle of the place. She befriends her neighbours and has cordial relationships with all of them and gradually, they too develop a liking towards her. But, she is very intrigued by one of her neighbours, Patrick Castagnol because of his reserve nature, part English name and fluent French. Equations of relationships between them changes when Bryony, Catherine’s younger sister visits her. She is smitten by Patrick's charm, leaving Catherine feeling decidedly uncomfortable. Catherine also faces challenges against setting up her business from the French bureaucracy and she has a hard time dealing with all the paper work. This book is about the little things of every day life. Rosy has drawn the poignancy of ordinary life. I just loved how she has portrayed a spectrum of relationships in various lights and shades. I also loved the way Rosy has given intricate details of the tapestries which Catherine creates. The description of the place is so vivid that one imagine the pictures of the location in their minds and the readers are gradually absorbed in the slow paced and relaxed life of the countryside. I found the book very relaxed, warm and quiet. In fact, I needed one like this after reading 'The Lovers'. Take this book, lie down and immerse yourself in reading it and let the magic of the book work on you. One of the best contemporary women literature of modern time. I picked this book after reading Lindy's review and I am glad I did. I will definitely recommend reading it to someone looking for a relaxed and soothing read. Oh,I loved this book.. was awesome. Well you know I did as it was me that led you to look for this in the library. I am so pleased that you liked it and thanks for the link much appreciated.